Image Sprites are a very good way to feed your application some images. Basically, it consists of combining a set of images in a larger one and then just caching it. When you need one of the small images, all you have to know are the coordinates of it on the large one. With this technique, you just need to load one image for the entire application and reuse it, instead of loading each image at a time. Here I'll be covering the implementation with CSS used on WebSites but you can use this technique wherever you want. Sure you can Google it and find a lot of matches telling you how to use sprites and CSS, but where's the "no pain" way of building them and their CSS? All of them will tell you to use Photoshop or any other photo editing tool but this will always take a lot of time. That's when this cute little application comes in. It will generate the sprite image and its CSS in no time, and you can add images later and regenerate it without having to worry about breaking your code! On the package, you'll find a compiled version and its source code. 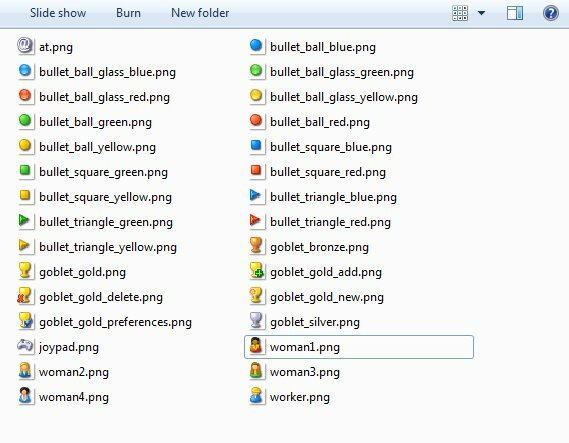 Just drop the SpriteCreator.exe file on the folder that has the images to be included on the sprite and run it. DONE! The size of the images will be the size of the first image loaded into the sprite. The big sprite image will always be square, having the minimum size needed to fit all images inside. All the images on the folder will be included on the sprite. Only jpg, jpeg, png & bmp extensions are supported. The name of the images is used on the CSS class name. This is a console application so you can pass some customization arguments.